NOTICE: Activation key must be used on a valid Steam account, requires internet connection. ABOUT THE GAME	THE standard for rally games returns to the top of the realism rankings with a brand new physics and rendering engine.Dirt, asphalt, mud, snow, ice… for the first time, the road surfaces have a real impact on car behaviour. You also have to learn how to fine-tune your vehicle to handle… the weather conditions and dynamic lighting. Winning on mud, at night and in the rain will take all you’ve got!Experience an even more immersive 2015 season with all of the WRC, WRC2, WRC3 and Junior WRC championship drivers, cars and special stages. Drive with precision along the snow-covered roads of Sweden and the rocky roads of Mexico, and take on the rally legends in 65 unique special stages in the entirely overhauled Career mode.Aggressive, cautious, hot-headed… Unleash the driver! KEY FEATURES The new WRC after a 2-year absence. Over 20 cars, 50 liveries and teams, and all of the WRC, WRC 2, WRC 3 and Junior WRC rallies. 65 new special stages in 13 countries, for over 400 km of racing! Hotseat and online multiplayer modes. Tyre, damage and engine tuning management: your car, your rally, your driving style. NEW IN WRC 5	New rendering & physics engine for unequalled realism. Perfect reproduction of real surfaces: snow, dirt, mud, asphalt, ice. Realistic spattering using a brand new particle engine. Dynamic weather. 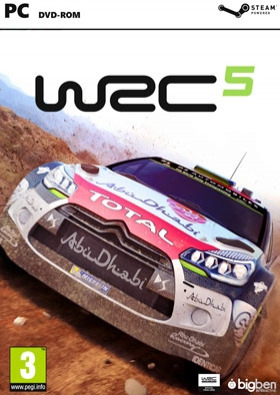 Night-time special stages.SYSTEM REQUIREMENTS MINIMUM: OS: Windows® 7 Processor: Intel® Core i3 / AMD Phenom™ II X2 Memory: 4 GB RAM Graphics: NVIDIA® GeForce® 9800 GTX / AMD Radeon™ HD 5750 DirectX: Version 9.0c Network: Broadband Internet connection Hard Drive: 25 GB available space Sound Card: DirectX Compatible Soundcard Additional Notes: The game also requires an Internet connection and a Free Steam account to activate. Minimum system requirements allow the game to run at 720p resolution at 30 frames per second, with all visual effects on lowest settings.RECOMMENDED: OS: Windows® 7 / Windows® 8 Processor: Intel® Core i5 2500 / AMD FX 8150 Memory: 8 GB RAM Graphics: NVIDIA® GeForce® GTX780 / AMD Radeon™ R9 290 DirectX: Version 11 Network: Broadband Internet connection Hard Drive: 25 GB available space Sound Card: DirectX Compatible Soundcard Additional Notes: The game also requires an Internet connection and a Free Steam account to activate. Recommended system requirements allow the game to run at 1080p resolution at 60 frames per second, with all visual effects on default settings.